Inking Aloud: What's the Buzz? I'm not a big coffee drinker (okay, I'm really not a coffee drinker at all ...), but I do love coffee themed stamps! The to go cup from the Coffee Break set from Honey Bee Stamps is another image I colored as part of The Daily Marker 30 Day Coloring Challenge. I used the matching die to cut out the colored image, then adhered it to a cream panel using foam tape. The image panel was adhered to a golden yellow panel with a hexagon/honeycomb pattern stenciled onto it with some distress ink. 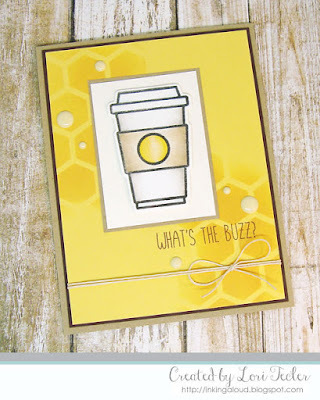 I stamped the "what's the buzz?" sentiment from the coordinating Perfect Blend set beneath the image panel in brown ink. The golden yellow panel was wrapped with some twine just beneath the sentiment and secured with a simple bow. A bunch of cream enamel dots positioned around the image panel completed the design. The panel was matted on contrasting dark brown cardstock, then adhered to a kraft card base to match the mat underneath the image panel. 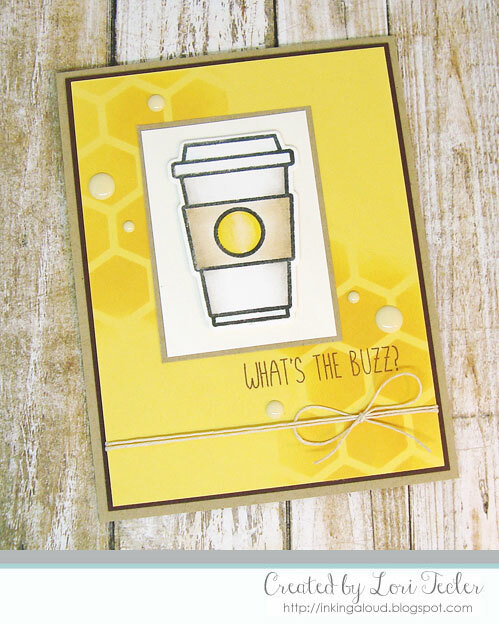 Love the honeycomb background and that pretty coffee cup!